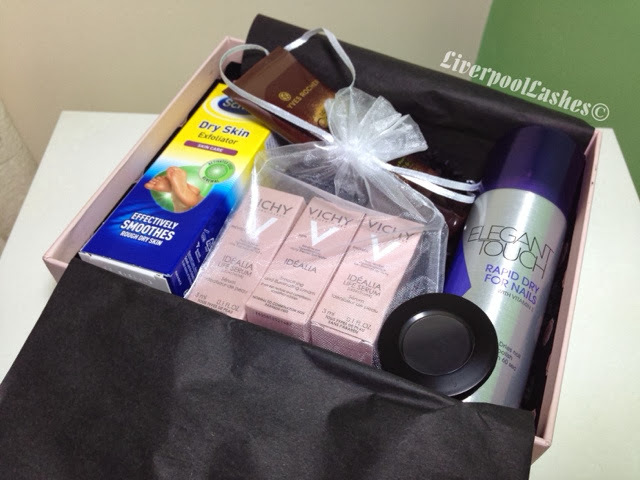 Today's post is all about November's Glossybox. If you've read last months review you'll know that October's box was pitiful and that's putting it politely. However as soon as November's box was delivered I knew it had to be a good one as it was noticeably a lot heavier. When I got to the stage of opening the tissue I did a little squeal, I'm not sure if it was out loud or in my head but in front of my eyes was a box packed with goodies. I feel like it's a shame to say this but I really do suspect that GlossyBox have a method of handing out a terrible box full of samples that you could have gotten for free, almost like they're stocking up on the good products for a 'big blow out' of the good stuff the following month. I feel like previous years a lot of the beauty boxes have done this before Christmas. Typically the best boxes are the Christmas ones so they're thrown out anything they could lay their hands on the months before. I can't speak for anyone else but I would put up with that and hold out for the Christmas box. I know this months is a good one but I mean generally, this is what I've noticed.